I’ve lived in Bozeman a long time. One of the things I’ve always appreciated about this community is how welcoming it is – to everyone. It reminds me of my Southern home where when company comes, we roll out the red carpet to show folks we’re glad you’re visiting. We throw a little extra supper on the stove and invite our guests to stay awhile longer, just because. Today, Bozeman, we have company coming. Between you and me, I’m not feeling all that hospitable. Members of the Westboro Baptist Church are coming to town. My first inclination is to do what my crotchety Great Aunt Willadean would do when unwanted guests showed up on her doorstep – pretend nobody’s home. You can knock all you want WBC, but Bozeman will just ignore you. But I don’t think that’s the answer. That might give them the crazy idea that our indifference legitimizes their message. They’ve got enough crazy ideas as it is. Unless you’ve been living under a rock, you’ve probably heard of WBC and the appalling tactics they take to share their reprehensible message. And they’ve chosen two institutions in our fine community, Montana State University and Bozeman High School, as places to visit. They are adamant about exercising their First Amendment right to spew their venom. And the Constitution gives them the right to do just that. Frankly, I’ll take venom from snakes any day. While I wholeheartedly disagree with what they have to say, how they say it and everything that they stand for, I took an oath as an attorney to uphold their Constitutional right to do so. I take those words as seriously today as I did when I first uttered them twenty years ago as a new member of the bar. In a democratic nation, we have to honor and respect that right no matter how offensive and objectionable we may find their words and actions. But by the same token, we possess that exact same right. And I intend to exercise it. Right here, right now. You have chosen to bring your message of hatred and intolerance to two of the finest institutions in Montana. Montana State University is committed to providing an outstanding education to the daughters and sons of this great state, from across our nation and around the globe. Montana State University opens the minds and hearts of students, fostering more than just their intellectual curiosity, but teaching the critical thinking skills necessary to become informed, rational and thoughtful members of a free society. Our university teaches tolerance and respect so students will enter the world not only with a college degree but with emotional intelligence and compassion that are essential to being human. Bozeman is proud of these fine young people who leave Montana State University as intelligent and enlightened citizens of the world. Likewise, Bozeman High School is an outstanding educational institution charged with preparing students for the next level of their academic careers and their lives. These dedicated teachers and administrators, not only at Bozeman High but also throughout our world-class school district, go above and beyond each and every day teaching our children more than just the standard curriculum, but nurturing a spirit of kindness and empathy. These educators should be applauded for their tireless efforts in the classroom and in our community that helps shape our children into fine young adults. WBC, if you would consider life beyond your picket signs and narrow-minded views, I’d encourage you to take a moment to learn something about the world you inhabit. Education is a proven cure for injustice, intolerance and ignorance. You really should give it a try. Regardless of our gender, our ethnicity, our religious views, our sexual orientation or our race, there is one common denominator not only in this community but across our planet, we are all people. 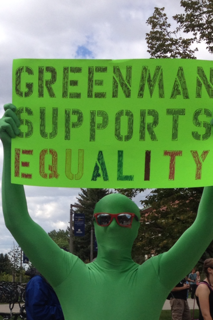 The citizens of Bozeman are proud to live in a supportive open-minded community who choose to co-exist. We actively embrace and celebrate our diversity. It makes our town and our world a better place. We are better people and a stronger community because of it. So WBC, don’t expect our typical warm welcome when you come to town. There will be no red carpet. While you’re here, you will most certainly observe that our town is a kind, peaceful and tolerant community. We like it that way. The people of Bozeman are tolerant of many things, WBC, but I can promise you this – hatred will never be one of them. This column appeared in the Bozeman Daily Chronicle on September 8, 2013.